Rock and Roll Hall of Famer Steve Hackett, lead guitarist for Genesis, returns to The Playhouse with the Genesis Revisited Tour, performing the band’s seminal album Selling England By the Pound in its entirety backed by a full band. 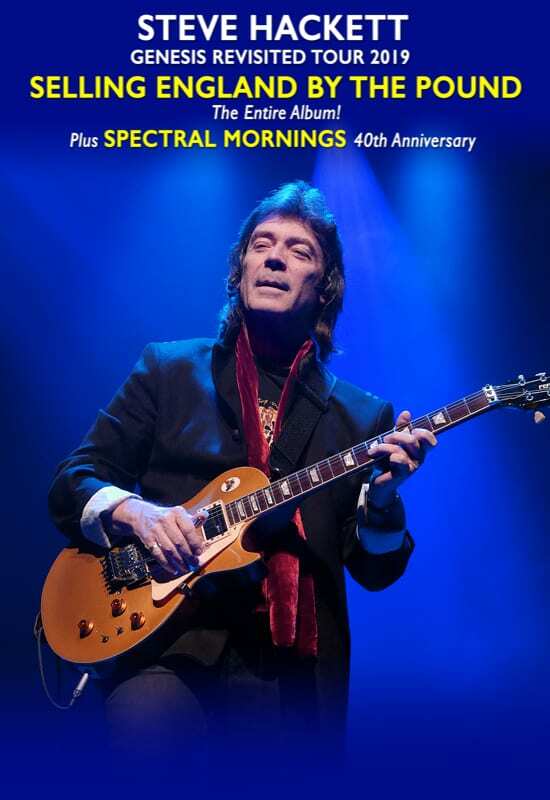 The show will also feature a special Spectral Mornings 40th Anniversary Celebration, along with other Hackett hits. His previous three Playhouse shows all sold out – get your tickets now! Acclaimed by many to be Genesis’ finest album, Selling England By the Pound, will be performed by Hackett and supported by some of the best musicians on the planet. Steve’s unique guitar work remains the fulcrum on which this challenging and exhilarating show is balanced. Steve Hackett is renowned as an immensely talented and innovative rock musician. He was lead guitarist with Genesis as part of their classic line up with Gabriel, Collins, Banks and Rutherford, that produced acclaimed albums such as Selling England By the Pound. With Steve’s extraordinary versatility in both his electric guitar playing and his composing, he involves influences from many genres, including Jazz, World Music, Blues and Classical.